If I were a magical beer fairy, OEC is the craft brewery that I would create for myself. The delicious and unique craft beers they make are only the start. The stories and processes behind these unique craft beers are what set them apart. Hold onto your fairy wings, because you’re in for a real beer-geek treat! From Foeders to Solera fractional blending systems to Granite Fermenters with lids weighing over 400 lbs each. And then there’s the Amphorae and African Calabash Gourds. Oh, and when a smoked essence is needed, you know they’re doing the smoking themselves. Obvi. And when they come across an ancient African method of burying beer underground? You bet they’re doing that too. Freezing barrels of beer? You know it. 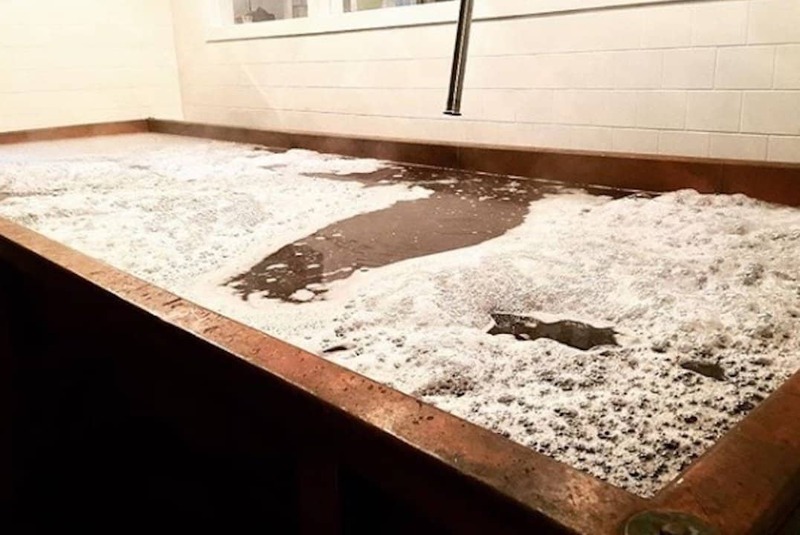 Coolship instead of a whirlpool and an old-school Baudelot Chiller? Yup. OEC stands for Ordinem Ecentrici Coctores…which loosely translated means The Order of the Eccentric Boilers (or Brewers). This is a secret society you definitely want to be a part of…especially if you’re a sour and wild beer lover like me. Even if you’re not though, the passion and time and effort that this wonderfully eccentric and curious production team of 4 puts into each and every beer that they make is, honestly, a lesson in what craft brewing is truly all about. Yet even for those of us who are 100% focused on unique craft beers, this attention to detail and unbridled enthusiasm is incredibly hard to find. 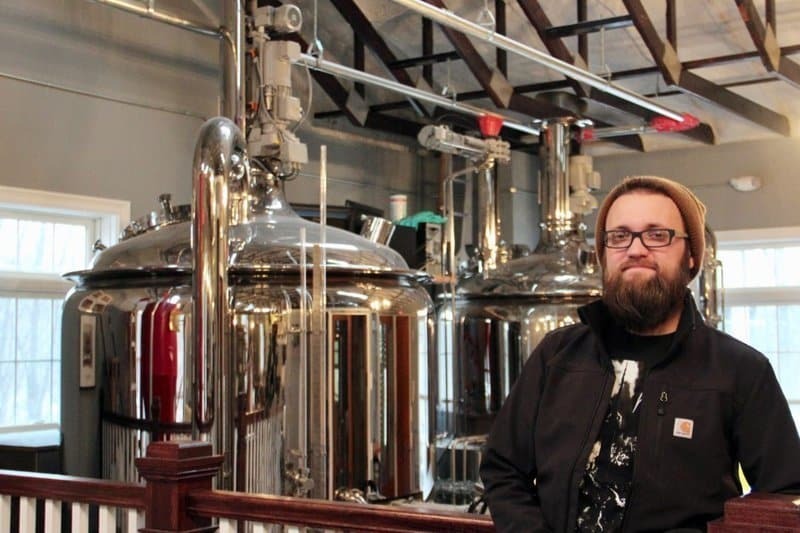 Come on in and meet our personal tour guide, Tony Pellino…one of the three brewers at OEC. He’s been brewing craft beer at home since before he could legally drink it and used to make mead in his mom’s Tupperware. Some people are just chosen for their path in life and you can tell this is true with Tony. He and Ben Neidhart, the founder/brewer, have been at this together from the start of OEC back in 2013. But before we even get into the OEC story there’s a deeper backstory that we need to start with. You see, Ben is the son of Matthias Neidhart who founded B. United International in 1994. B. United is a craft alcohol distributor focused on only importing beers, meads, ciders and sake that are of the highest quality and character. Honestly, if The Crafty Cask was a distributor this is who we would be. So while I know distributor is often an evil word in the craft world, these guys are pretty different. So much so that when they import beers that are dry hopped (or dry spiced) they receive the liquid and hops (or spices) separately from their partners across sea. Then they put that final touch on these unique craft beers themselves on behalf of the craft producers. Why? So that you are buying and drinking the freshest version of that beautiful beverage possible. How’s that for quality control and care? So around 2010, when Ben started thinking about these great products B. United was importing and all of the cool things they could do with them the kernel of OEC was born. What is now known as The Zymatore Project is how OEC began. B. United started approaching select producers from their portfolio and asking them to collaborate in the truest sense of the word. Essentially, craft alcohol producers entrusting Ben to take their base beer/mead/cider/sake and age it or blend it into a new beer to sell under a collaborative label. As Ben began to build the infrastructure to support these projects making their own unique craft beers became the logical next step. Now, the beauty of OEC being backed by B. United is that this allowed OEC to start small and slow. Whereas most craft breweries don’t have that luxury. Most new craft breweries are brewing for maybe 2-3 weeks before opening their doors. OEC? Had 6 months of brewing time…which is a good thing because OEC is definitely the “slow and low” version of the craft beer world. While many breweries seem entirely focused on cranking out as many new beers as humanly possible every year, OEC takes their time and allows the art of many ancient brewing process to take over. Making every As Tony said himself, “It’s up to us to create a great environment for the wild yeast to do its thing. And then it’s up to us to find it at the right time…that’s the art.” While OEC is certainly now a self-sustaining business on its own, that initial luxury and to some degree the continual safety net of the B. United partnership allows OEC to experiment, fail and thrive in ways that many other brewers only dream about. Before we get to the beer let’s talk a bit about the property to give you a sense of the overarching vision. They have a smokehouse on their property so that when they need smoked malt or other elements for their projects Tony is smoking them himself over their old barrels. And occasionally he makes some jerky down there too. Speaking of food, they also have a bakery and a coffee roaster on their property. Their bakery, run by Matthias and his wife, uses no water for their breads..only the final runnings of the brewing beer and the naturally occurring yeast from their property. We’ll talk more about these native yeasts in a bit. And the coffee? While not yet publicly available Tony swears it’s some of the best he’s ever had. They take naturally processed green coffee beans (read put in the sun so the cherry can ferment off vs. washing it off of the pit like most coffee producers do), vacuum seal them with oak staves from their barrels soaked in their beer, maybe put some of their estate fruit in and let it all ferment together before roasting.There’s also two greenhouses (one filled with exotic citrus only! ), an orchard, two vineyards for grapes to co-ferment with their beers, a bee hive and a vinegar barn. Yeah, I’m kind of voting for OEC to take over the world. How Do They Make The Most Unique Craft Beers? On to the unique craft beers! First, let me just preface this all with the fact that what I am about to share is not the exception, it’s the rule. So these seemingly “strange” ways of making beer aren’t for only a small portion of their production or occasional experiments. This is how they make their unique craft beers. All of it. They take a lot of old world ideas that are often complex and arcane and modernize them a touch. And if that takes longer or costs a bit more, so be it. At the end of the day, they are dedicated to the forgotten beers and processes…and they’re dedicated to staying true to who they are. Which means wild and sour beers only. Nope, no Hazy IPAs coming out of this New England brewery. And given how good their beers are, it seems like they’ve taken up a pretty worthy cause! To start, all OEC beers use only wildly occurring and cultivated yeasts from the OEC property (which is basically an urban farm oasis in an industrial park. No, really). For example, one yeast that they now always use for their Phantasma beer was harvested from the gooseberries on their property over 5 years ago. And when it comest to adding elements to the beers in their Experimentalis line? Only fruits and herbs grown on their property are allowed and they’re picked minutes before being added to the beer. All of their beers are also either open or spontaneously fermented. You can see some of that fun in action above. That coolship I mentioned earlier? While there are a few other breweries in the US that have coolships most of them only use it for a small portion of their beers, usually Belgian style. At OEC, however, every single one of their beers goes through their coolship. Most only for an hour or so but some spend up to 2 days here in the Spring and Fall when the yeasts and bacteria in the air are most helpful. Are you noticing a trend here? There are A LOT of points in OEC’s brewing process that allow naturally occurring yeasts in the air to come in and play. Which means terroir. Yet also means risk since this opening up of the brewing process is less controllable than the standard practices most brewers take. Art vs. science, really. What the heck is that?! That was my question at least. This is a Baudelot Chiller. After the coolship, beers that are still warm are piped on over the Baudelot Chiller. When OEC had this made for them it was the first one the producer had made in over 100 years! I mean honestly, even Google doesn’t have a good grasp on this thing from what I’ve seen. 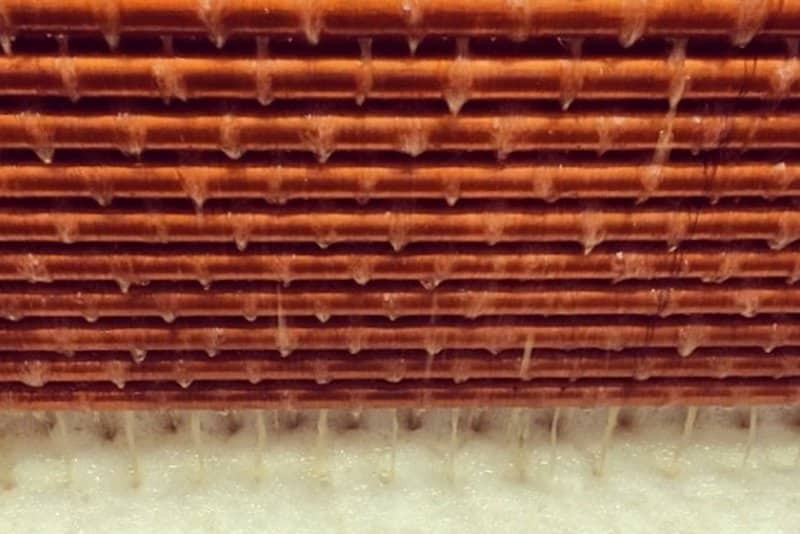 Think of it as a beer waterfall where beer is flowing over copper pipes filled with cold water. This both cools and aerates the beer…in a most compelling and beautiful way, I might add! 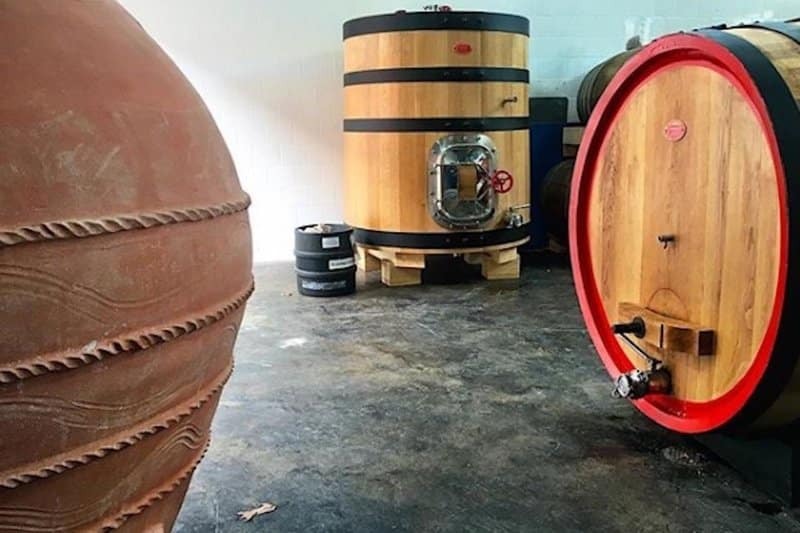 First, let’s talk about the two 800-liter Sangiovese Casks they have. Each one of these always has the same beer in it…one is filled with their Lambic-Style, spontaneously fermented beer, Spontalis. The other is always filled with their Flemish-Style Red Ale, Antioch. The reason these two barrels are always filled with the same two beers is because these are considered “mother blend barrels.” Meaning that there is always beer in here for them to pull and blend with other beers…because they really like these beers for blends. In fact, they like blends a lot in general since almost all of their beers are blended beers. Next up we have the Amphorae! 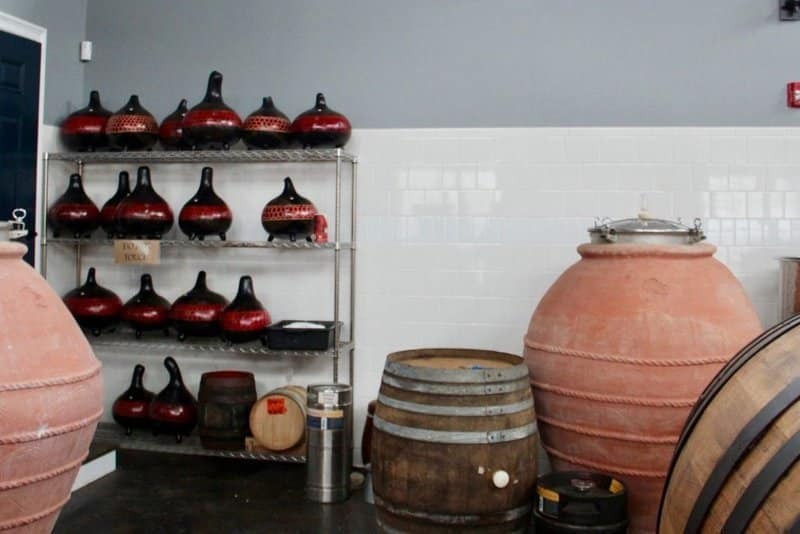 These beautiful pinkish ancient-style terra cotta Etruscan vases that were used throughout history to transport wine. Tony is dying for these things to start cracking already so that he can start to mend and line them with interesting things like sap and further experiment with the beers they’ve been making in them! Oh, and those Calabash Gourd’s you see in the background (with a prosciutto air-curing beside them I might add)? Those were sent over from one of B. United’s South African mead producers so they can experiment with fermenting inside of them, which is exactly what they’re doing. And that mead producer…well they sometimes blend his mead with their sour beers to make braggots, obviously. Are you familiar with Solera systems? They’re best known for their use in Sherry and Port production but that doesn’t stop OEC from using one! So the cool thing about this, particularly since OEC is so into blended beers, is that it creates a fractional blending of the beers. When ready to bottle you always take from the bottom and then refill from the row of barrels (filled with the same beer) above. 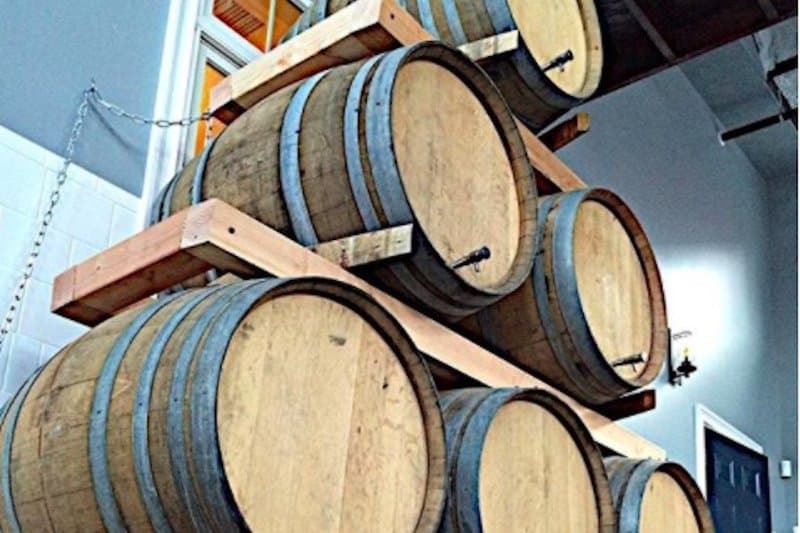 This allows portions of the beer in each barrel to age longer since it can take upwards of 10 years to fully deplete the initial beer that was put in all of the barrels. This develops incredibly complex age and character. While old beer is normally frowned upon this system ensures that the old beer never gets stale since it’s constantly getting fresh infusions and keeping these wild beers alive. Neat, huh? Told you…wild, weird and wonderful! Moving on to their Bavarian Blue-Grey and Spanish Rose granite fermenters. 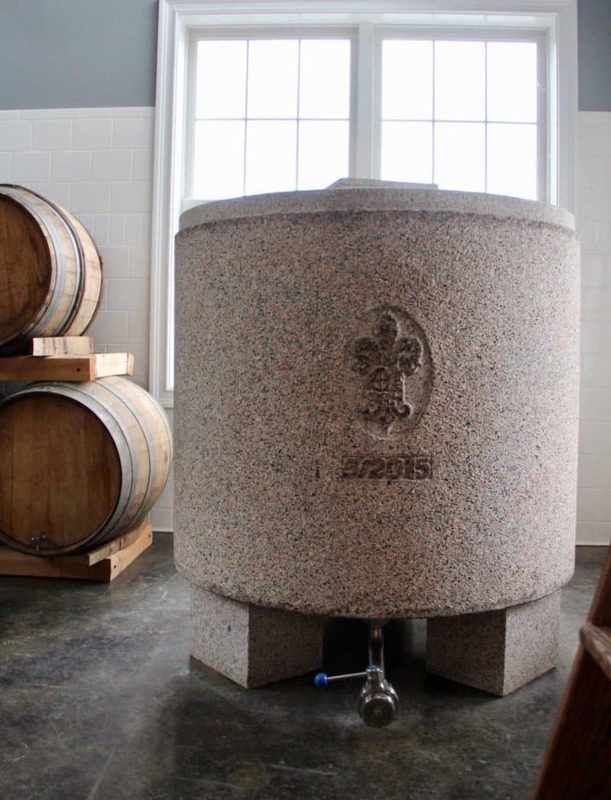 While concrete is starting to become a little more popular in brewing, these two granite fermenters might honestly be two of only a handful being used for beer production in the world. So, OEC is definitely paving the path here and they’re really enjoying what they’re tasting. The granite imparts a minerality and also some level of flavor. The Spanish rose granite, for example, imparts a deep red berry character, according to Tony. Whereas the Bavarian blue-grey granite is completely different. Fascinating. As are those 400-lb granite lids. Jeesh. Let’s head back in to nature, shall we? The last two approaches I want to share are incorporating mother nature and those lovely New England winters into the mix. The first is in their Eis Barn (which magically transforms into their hot house in the summer!). This is where they intentionally try to let barrels filled with beer freeze to concentrate aromatics, flavors and alcohol content. 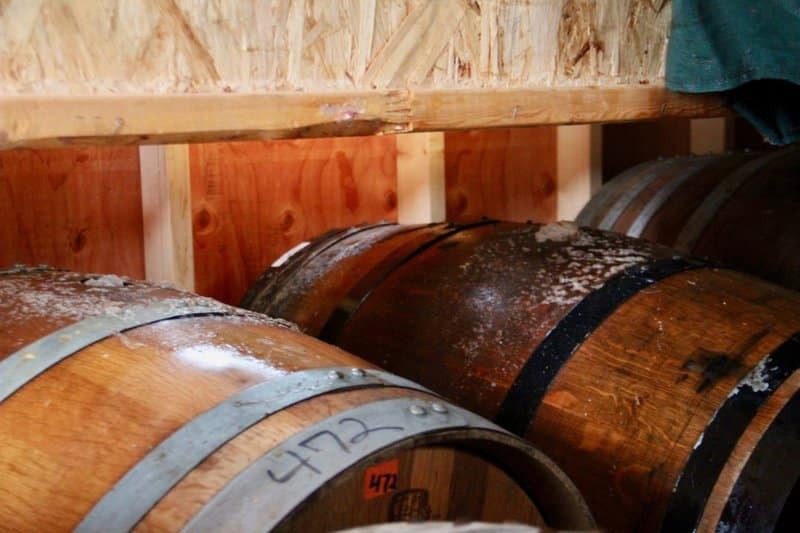 Lucky me…this winter was the first time it’s been cold enough for their barrels to freeze in three years so there will be some nice ice-bocked beer coming up at OEC! 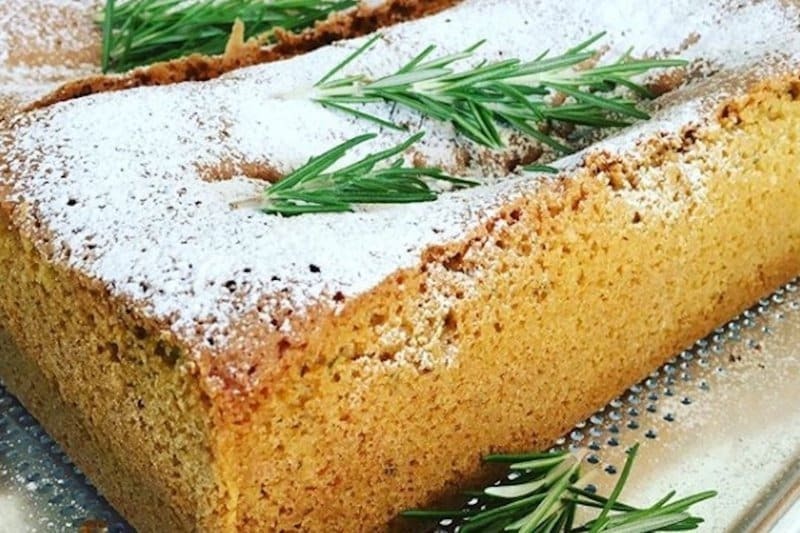 The other au natural approach hails from Africa where they make Urwaga. Urwaga is a banana, sorghum beer of sorts but the unique process that OEC is borrowing is how they bury the barrels underground. Often, in Africa for the first two days they leave the barrel un-bunged and bury it underground with native flora all around it. Then they dig it back up, bung it and then re-bury it for a year or two. Unfortunately the barrel was frozen underground while I was there, but Tony swears this approach develops a brett-like character he’s never experienced or found anywhere else. Talk about taste of place! Wow! There sure is a lot to OEC Brewing…I think we’ve earned ourselves a beer. These are two of the bottles that I brought home with me. Tempus is their flagship, but c’mon now you didn’t really think it would be that straightforward did you? So while Tempus is their flagship it’s made more like a wine than a beer in the sense that no two vintages will ever be the same. 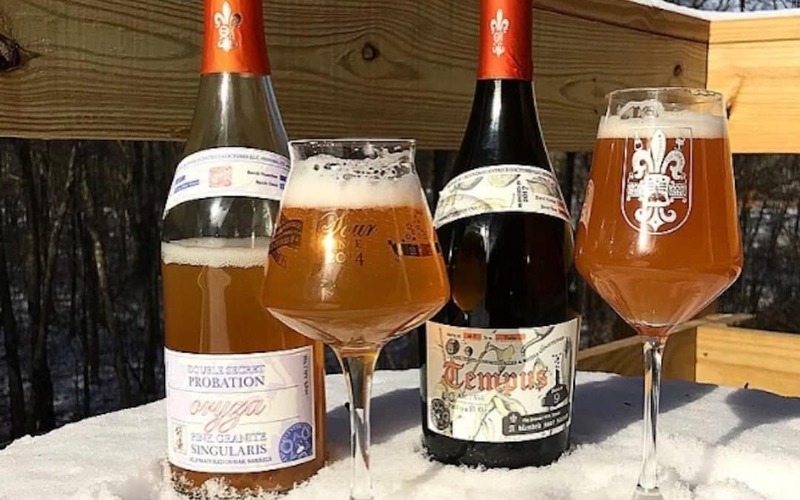 It’s a sour saison and I got my hands on Tempus #9 which is a a blend of 20% young Tempus lagered for at least 6 months in foeders blended with 25% 18 month old lambic style ale & 55% one year old saison aged in red & white wine barrels. Say that three times fast! The second bottle is also super unique and like nothing I’ve ever tasted. Double Secret Probation Oryza is a blend of OEC sour ales matured in oak barrels and then double matured for an additional 9 months in their pink granite fermenter. It is then blended with unfiltered sake from Kikusakari Sake (from the B. United portfolio) in Japan. I have one word for both of these beers…incredible. So now for the bad news…you can only get OEC beers at their brewery unless you happen to catch one of their very occasional kegs that make it out to bars across the country. The good news is that OEC is totally worth a trip to Oxford, CT…especially if you can time it to catch one of Tony’s rare group tours. I mean seriously, this is a bucket list brewery that can’t be missed. Does this stuff excite you as much as it does us here at The Crafty Cask?! 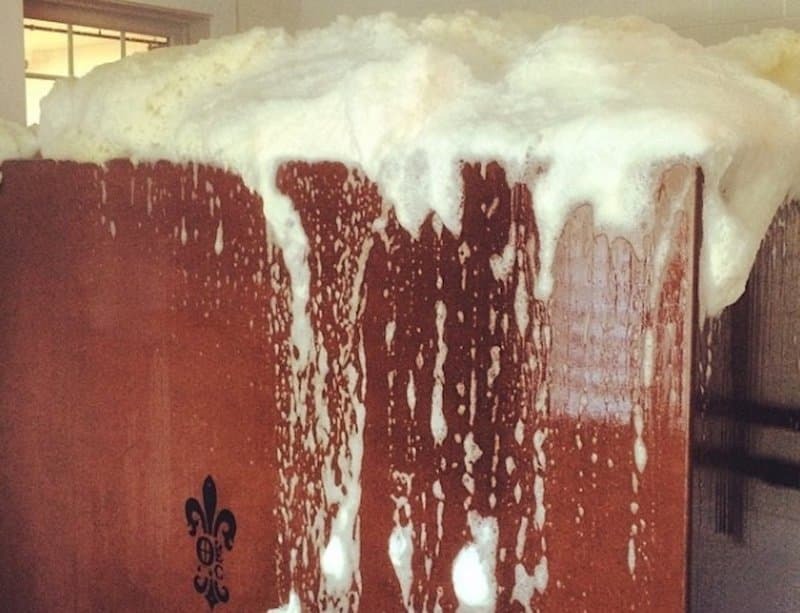 What are some of the craft beer-making processes that you’ve encountered and been wowed by? While I know sometimes obscure processes are just for show instead the true cause of great beer, I can confidently say that is not the case with OEC. When you find a brewer like OEC, one who hits the trifecta of great beer, amazing story and a dedication to innovative brewing processes, it’s a pretty exciting find and I’m thrilled to share it with all of you!